Ever since Lincoln got the hang of biking on our rough terrain, he and Sidney have been blurs whizzing by me. They’ve made this poor Mama’s heart catch as they learned to fly down our very steep, very long driveway. 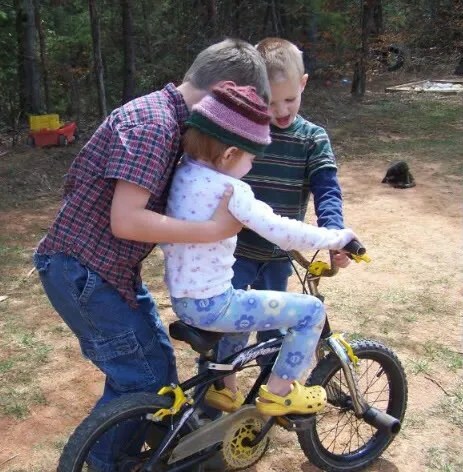 Watching her brothers have so much fun has stirred Rachel’s interest in trying a bicycle. So Sidney and Lincoln helped Rachel on Lincoln’s old bike. Lincoln: Oh Rachel, are you okay? Are you okay? Rachel: Waaaaaaaaaaa! Dirty! Waaaaa! Dirrrrrrrteeeeeee!